Following Doctor Who’s cancellation in 1989, occasional attempts were made outside of the written medium to keep the franchise alive and more prominently in the public eye. 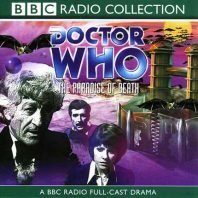 One such venture was 1993’s ‘The Paradise of Death,’ written by Barry Letts and reuniting Jon Pertwee, Elisabeth Sladen, and Nicholas Courtney to effectively recreate the beloved Third Doctor and UNIT era. Unsurprisingly, all of the hallmarks of the Pertwee era are present, and the story starts familiarly enough as UNIT is called in to investigate an unexplained murder at Hampstead Heath’s new theme park, Space World. Yet as the mysterious backers, the Parakon Corporation, and the Experience Reality machines employed come into focus, it’s instantly clear that this theme park is anything but built simply for amusement. Indeed, the Experience Reality machines- aside from providing a perfectly visual entrance for the audio medium that features heightened images of gladiators and monsters among others- highlight the unique danger that this threat poses, the danger of someone being able to force specific words out of another’s mouth hidden beneath the allure of a realistic simulation beamed into one’s mind. Letts also takes advantage of this story’s placement near the end of the Third Doctor era and shifts the story off of Earth and eventually onto Parakon itself to fully realize the scope of the fiendish plan in action that is being shrouded by offers of advanced technology and new trading partners. Wisely, Letts does not shy away from instilling darker and more meaningful elements into his story that is otherwise built upon action, spectacle, and intrigue, and though the fact that the virtual experiences focusing on murder are the most popular is a harrowing fact, the utter horror of the fate of the civilian refugees being mortally gassed and then processed into fertilizer for the dying world around them is an incredibly sombre core around which to build the narrative. Thankfully, the three lead performances are superb and help the script prove just how welcoming this era of the programme is to further exploration. Though all of the voices are understandably older, the enthusiasm that each brings to the role is infectious and adds an instant air of familiarity and comfort to proceedings. Pertwee, in particular, seems to relish his opportunity to return to the titular role, and he deftly handles intense fight scenes and more dramatic moments of moral decrees, compassion, and consternation with ease. With elements that expand Sarah Jane’s journalistic passion and that hint at political drama involving the United Nations and UNIT, ‘The Paradise of Death’ makes great use of both Elisabeth Sladen and Nicholas Courtney as well, and it’s wonderful to see the Brigadier have the opportunity to prove his mettle and take the fight to someone outside of his usual bureaucratic confines.